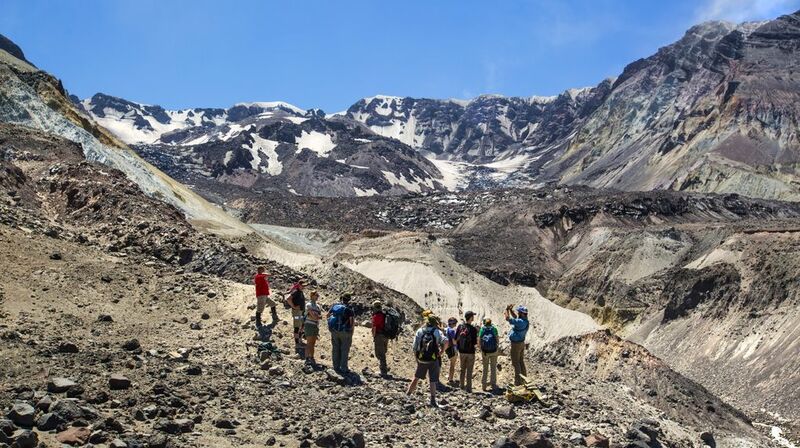 St. Helens’ Crater Glacier is growing when most glaciers around the world are shrinking. Ray Yurkewycz perched on the rim of the Northwest’s most restless volcano and marveled at the primordial forces at work. Rocks and boulders sloughed off the crater walls, kicking up plumes of dust as they clattered down the near-vertical slopes. Steam rose from the twin magma domes formed after Mount St. Helens’ cataclysmic eruption in 1980 and the quieter outburst that started in 2004. 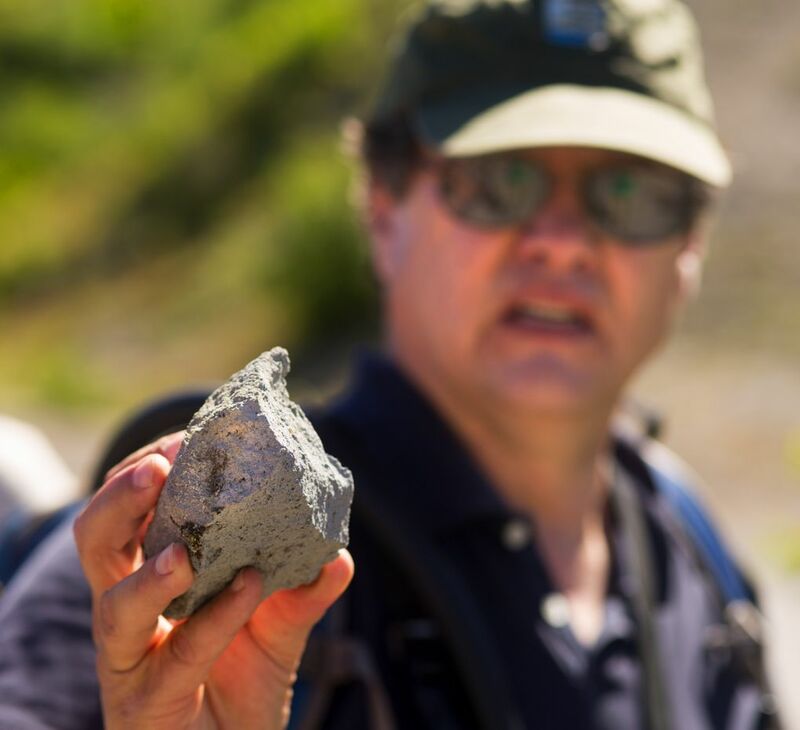 But Yurkewycz, operations director for the nonprofit Mount St. Helens Institute, was focused less on the volcano’s fiery past than its icy present. Few people realize, he said, that the hollowed-out crater where lava was flowing just a few years ago now holds the world’s youngest glacier. And if that’s not surprising enough, the prosaically named Crater Glacier is also growing at a time when most glaciers around the globe are in rapid retreat. Yurkewycz led a small group to this ridge on the mountain’s northeastern flank last week to preview a guided hike that offers a rare, close-up view of the glacier. Even climbers who tag the summit on St. Helens’ south rim sometimes can’t see into the crater because of overhanging ledges of snow. A veteran mountaineer died in 2010 when a cornice collapsed and he fell 1,500 feet. 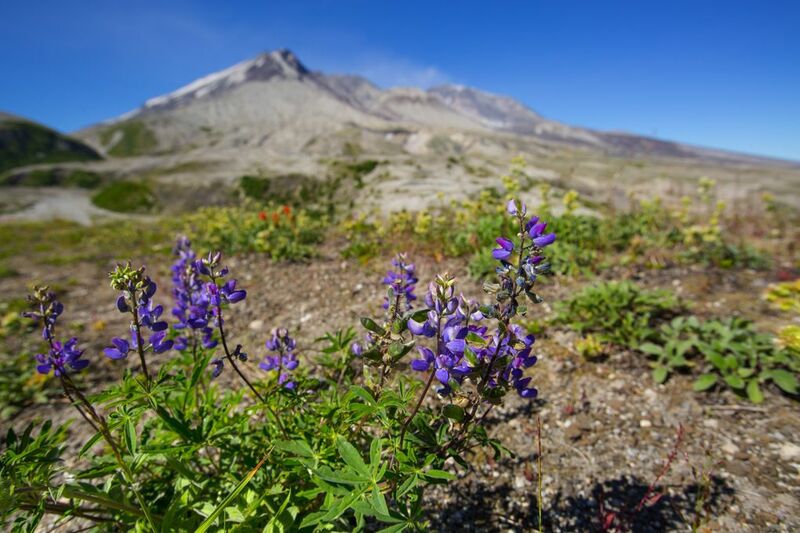 On the volcano’s north side, where the 1980 blast scoured away all life, the U.S. Forest Service — which manages Mount St. Helens National Volcanic Monument — has long limited public access. 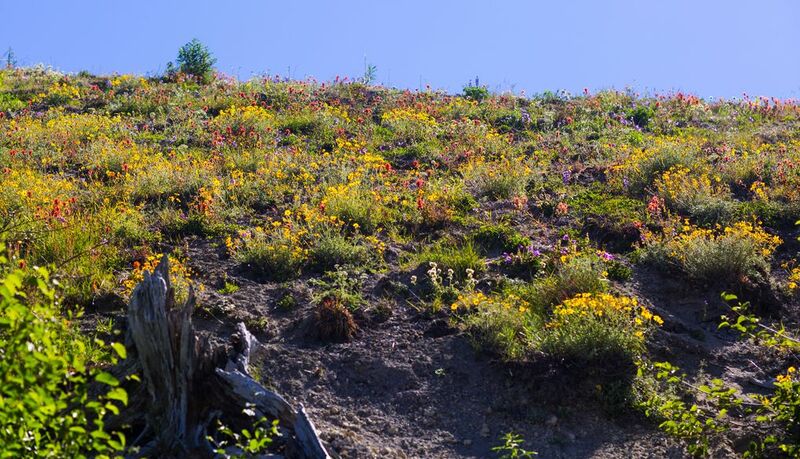 Not only are the rugged upper slopes treacherous, but the area serves as an open-air laboratory for scientists tracking the ecosystem’s recovery. The guided, glacier-view hike exempts visitors from some of those restrictions and allows them to scramble off-trail to the vantage point. 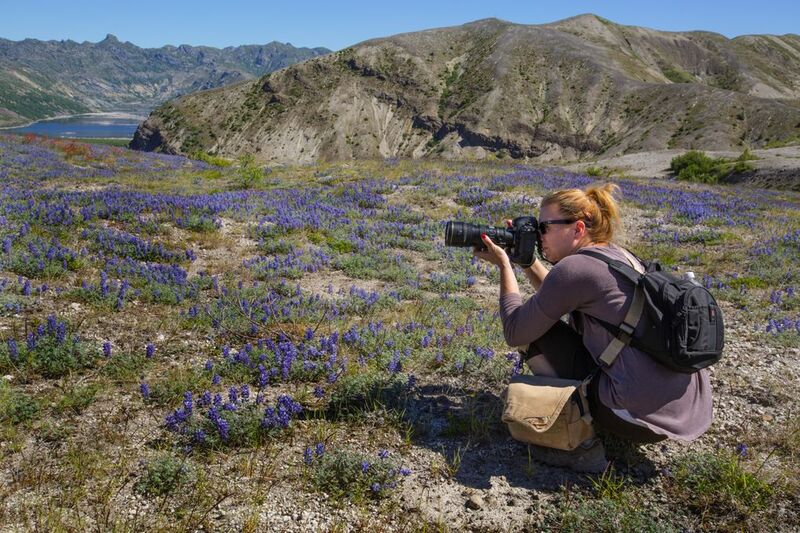 Mount St. Helens Institute debuted the outing three years ago and is expanding the schedule to nine dates this year, beginning in late July. 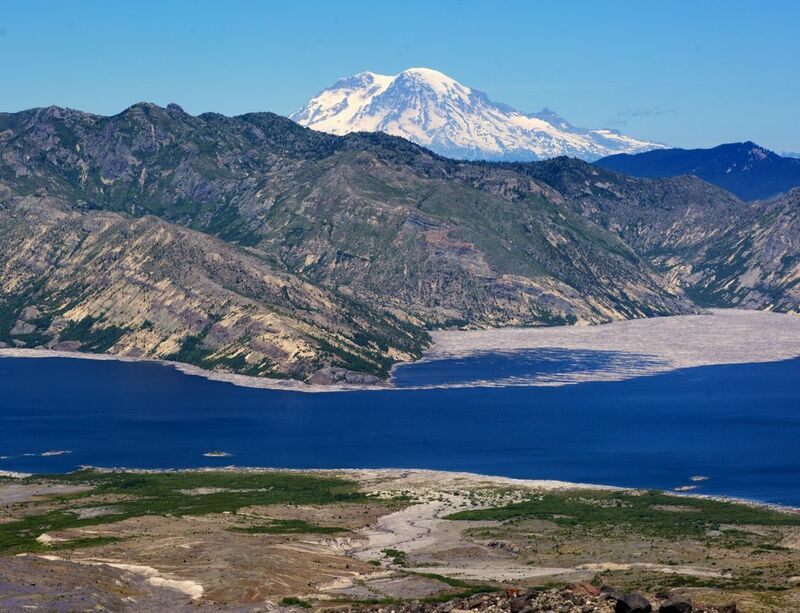 While critics object to the $195 price tag and are pushing for greater access across the 110,000-acre monument, one elite group has been making regular forays to the crater glacier since the early 1980s: scientists at the U.S. Geological Survey’s Cascades Volcano Observatory. They’ve documented the unique conditions that led to the glacier’s formation and tracked its stunning growth spurts. And they still find it fascinating. 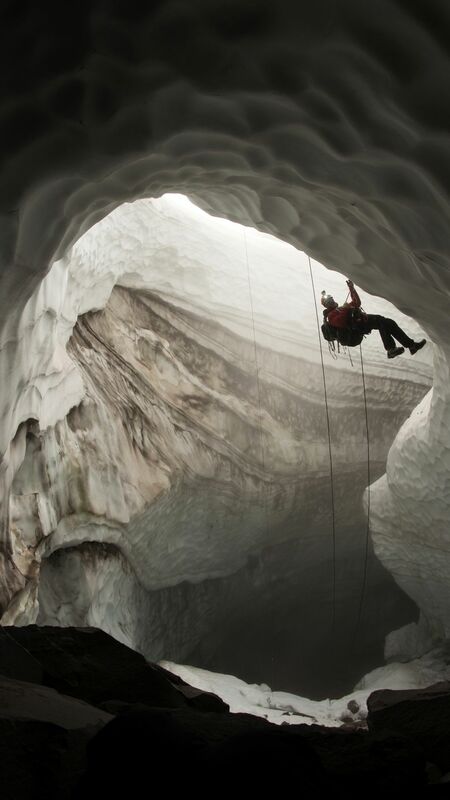 “Nothing about this glacier is typical,” said USGS scientist Steve Schilling. 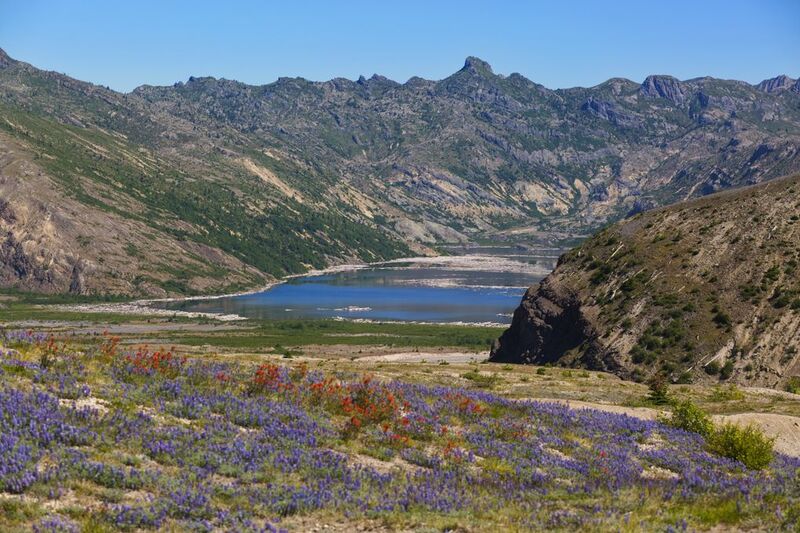 Before 1980, Mount St. Helens was a post-card-perfect cone draped with about a dozen small glaciers. Most were obliterated or melted on May 18 of that year, when the mountain’s north side collapsed, unleashing the biggest landslide ever recorded. An explosive, lateral blast vaporized everything in a miles-long swath and leveled 230 square miles of forest. When the dust and ash settled, what was left was a horseshoe-shaped shell of a mountain with a few remnant snow fields clinging to its flanks. But that shell provided a perfect nest to nurture a baby glacier. Its northward orientation helped shield snow from the sun. A thick layer of loose, volcanic rock collected on the crater floor, providing an insulating barrier against volcanic heat rising from below. And when a magma dome began bulging upward — eventually growing nearly 900 feet high — it formed a sheltered niche along the crater’s back wall where snow could pile up. 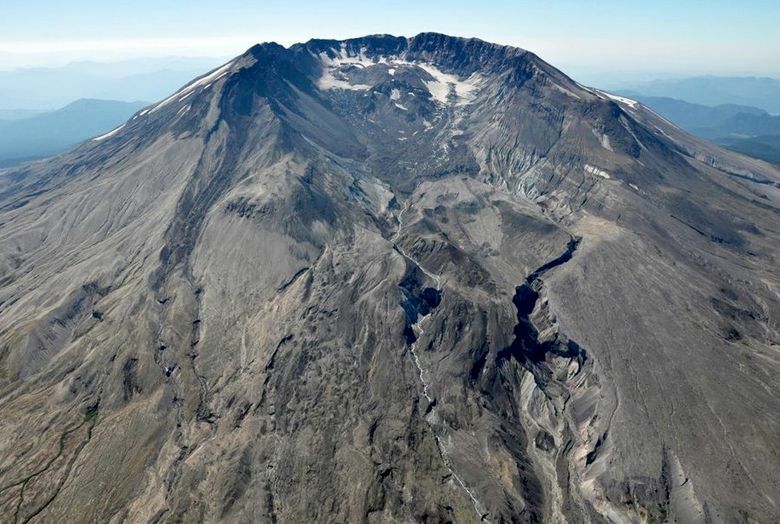 St. Helens’ horseshoe-shaped crater faces north, shielding newly fallen snow from the sun. 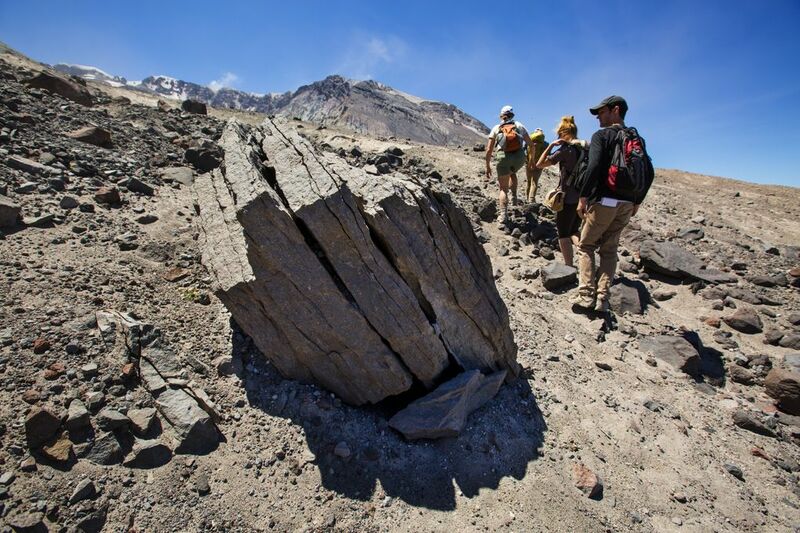 Thick layer of volcanic rock on crater floor provides insulating barrier against volcanic heat. Bulging magma dome shelters ice along crater’s south wall. Snow and ice slough off the rim and walls into the crater. Normal snowfall alone can’t account for the glacier’s formation, though, said USGS geologist Dave Sherrod. An extra boost comes from the loads of snow and ice that slough into the crater off the rim and walls. By 1988, a permanent snowfield more than 200 feet thick nestled in the crater. 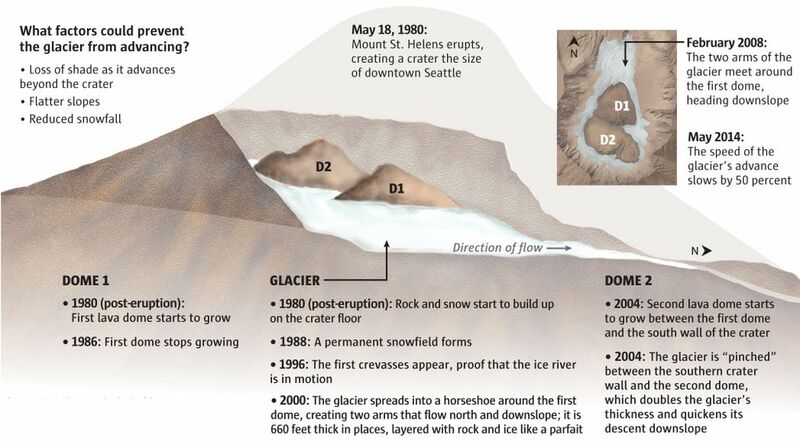 In 1996, the first crevasses appeared — evidence that the frozen mass was in motion and met the definition of a glacier. But things really got weird in 2004. That’s when the volcano sputtered back to life, intermittently spitting steam and oozing thick, pasty magma in a low-key eruption that lasted for several years. The magma quickly built a new dome taller than the Empire State Building, and it wedged between the old dome and the crater wall. The USGS team held its collective breath, fearing the heat would liquefy the glacier and send water and mud rampaging through the valleys below. But the ice was so well insulated by its underlying rock layer that very little melted away. Instead, the new dome pinched the glacier against the crater wall. That had the effect of thickening it and accelerating its downhill motion. By 2005, the arms of the horseshoe-shaped glacier were moving as much as 8 feet a day. Three years later, the arms met and merged in front of the old dome, forming a doughnut of ice. Now, the combined mass is creeping farther down the valley. 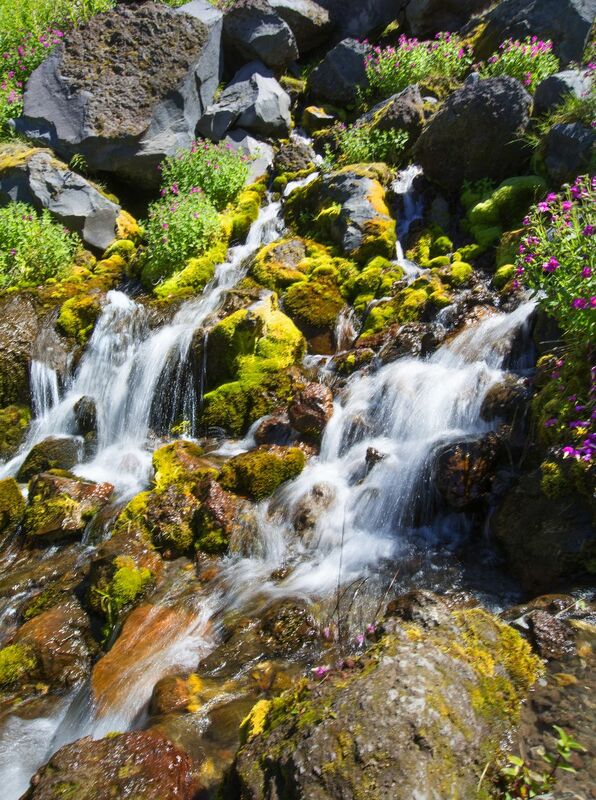 A steady stream of meltwater called Loowit Creek also springs from the base of the glacier, nourishing willow thickets, penstemon and a carpet of lupine on the once-barren pumice plain below. The ice is about 650 feet thick in places, Sherrod said — deep enough to swallow the Space Needle. Measured in a straight line from head to snout, the glacier is 1.25 miles long. But even from the vantage point afforded by Yurkewycz’s guided hike, Crater Glacier doesn’t look much like other Northwest glaciers. 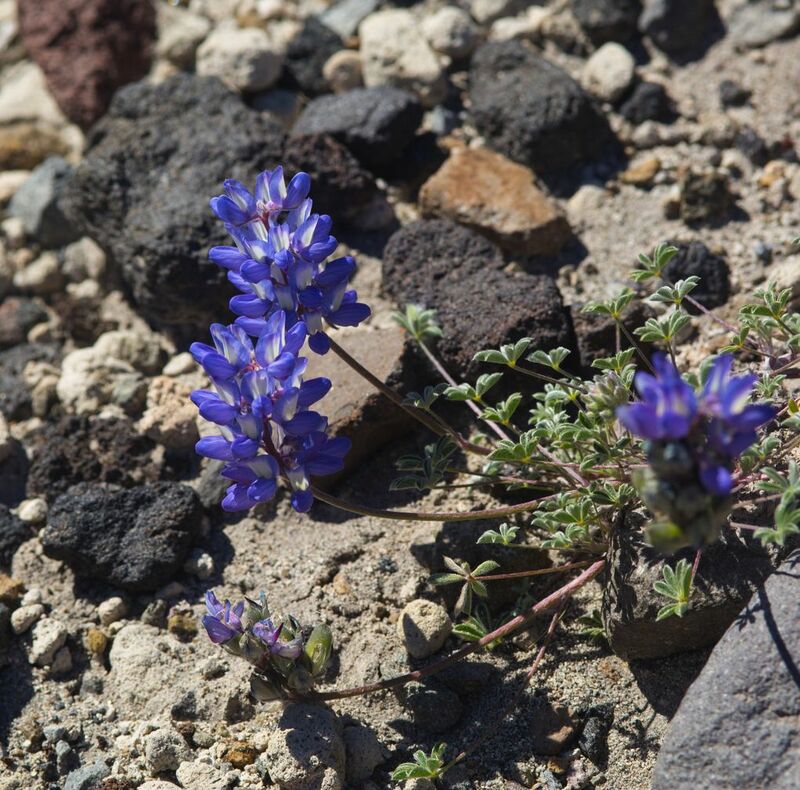 The surface is so littered with volcanic rock that only a few glints of blue ice are visible. In fact, Schilling estimates nearly a third of the glacier’s mass is rock. And just as the thick layer at its base provides insulation, so, too, does the layer on its surface. Schilling and Sherrod use aerial photography and lidar surveys to track the glacier’s movement, but they also walk its surface and directly measure the downhill progress. Toxic gas occasionally wafts from the magma dome, and the interior of the glacier is riddled with cavities carved by the heat from fumaroles. A group of expert cave mappers got permission last year to explore those caverns for the first time. 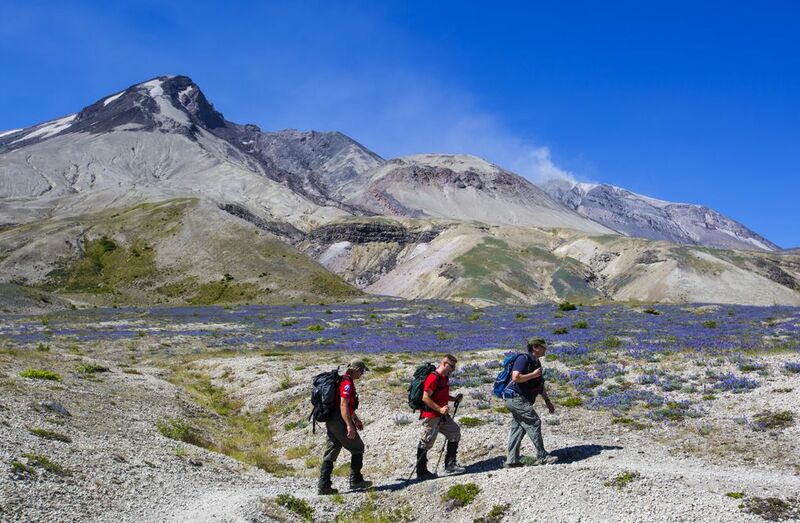 They rappelled in through a funnel-shaped mouth they called the Godzilla Hole, said Jared Smith, lead guide for the Mount St. Helens Institute. “It’s probably 80 or 90 feet straight down,” Smith said. Inside, they found a steamy wonderland of sculpted ice and tunnels. But it was also perilous, with slabs of ice peeling from the walls and scalding gas hissing from vents. The expedition was part adventure and part training for Smith and other members of local search and rescue teams who are called upon to haul out injured hikers and recover bodies. The crater and glacier remain off-limits to the public. 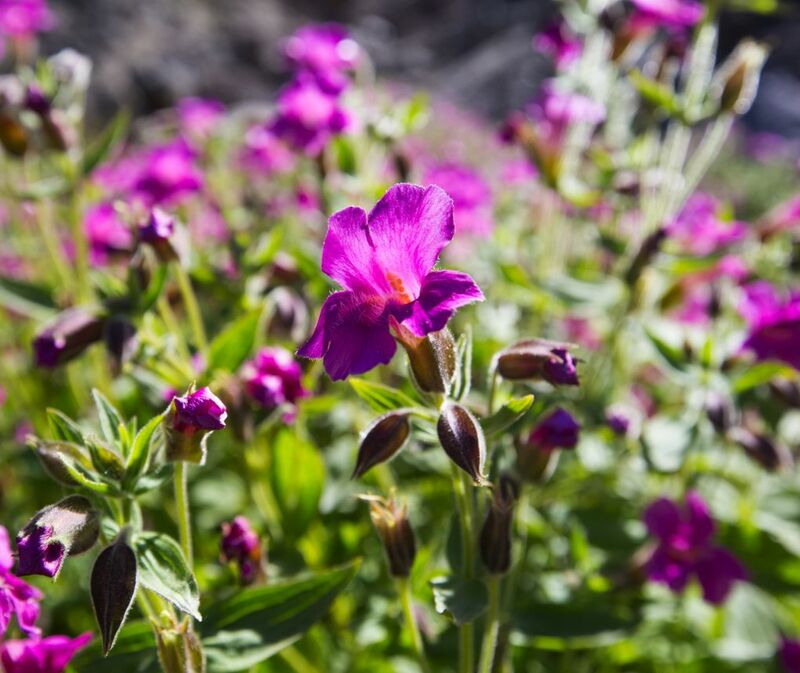 The rest of the 30,000-acre restricted zone on the mountain’s north side is open to day hiking, but closed to camping and off-trail travel. The only exceptions are the institute’s paid hikes, which also include a $600 trek to within a few hundred feet of the glacier’s terminus. 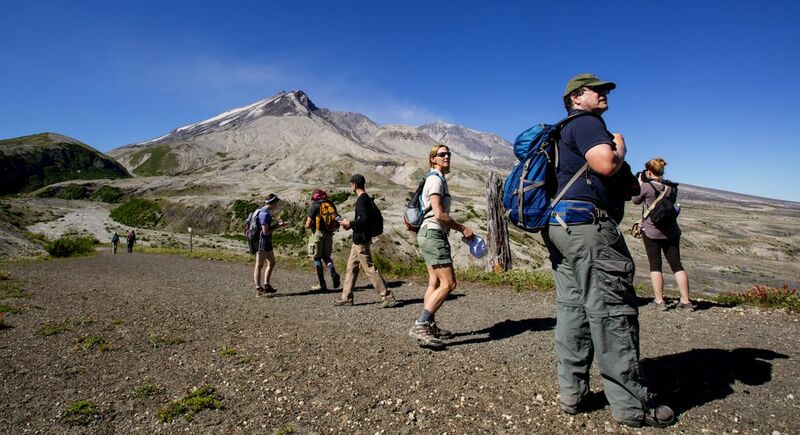 Income from the hikes helps fund the institute’s volunteer and education programs. But the restrictions and cost are irksome to some local residents and outdoors enthusiasts. The Longview Daily News recently chided the monument for its “pay-to-play” approach. The agency is concerned that increased access will bring more accidents and require more rescues, said monument scientist Peter Frenzen. 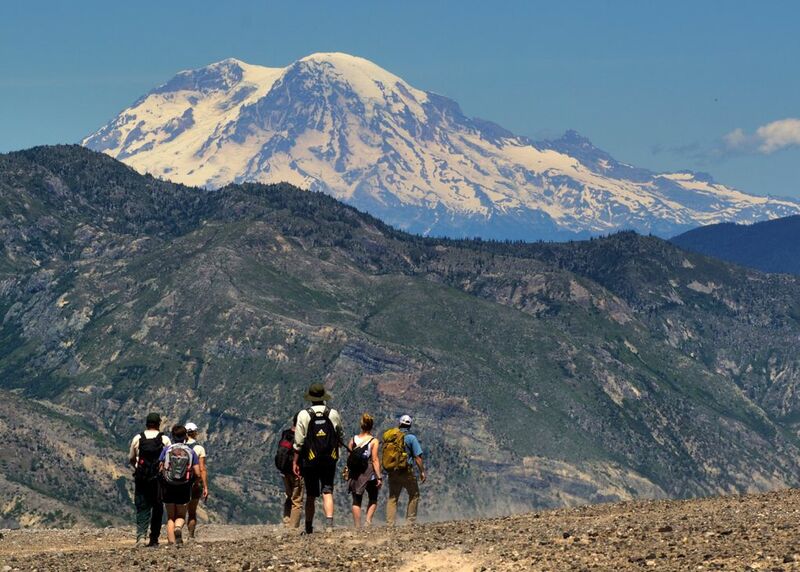 But monument staff also plan to evaluate the impact of this year’s glacier-view hikes and consider a route to the overlook that could be open to all in the future. Meanwhile, the USGS scientists will continue to keep an eye on the glacier. Its advance slowed considerably last year — to about 2.5 inches a day, Schilling said. And once the toe extends out of the sheltered crater, the accumulation of snow and ice likely won’t be sufficient to drive it much farther down the mountain. With 2015’s hot temperatures, it’s even possible the glacier could start shrinking.